I am on a long weekend again. Nope, not a long Public Holiday in BullehLand, it's only 1 day of Deepavali for our Hindu friends. But I am clearing my annual leaves now as year end is nearing and my company doesn't allow carry forward of leave days to the following year. To my own disgrace, since I changed job, I have many daily errands piling up on my plate, such as bills, statements reconciliation and one of these is Touch N' Go rebate that few of my friends have forwarded me some links moons ago. If I am not mistaken, the rebate was announced in conjunction with the Merdeka Day 2 months ago. Since my increment can never beat the inflation, so I told myself not to park it aside anymore, gotta save every single penny for the Mega Project. A simple page without much scrolling, and only 3 steps to follow to enjoy the rebate. Is this a change from 1Malaysia?! I continue reading. The whole thing sounds to me that nothing extra I need to do to be eligible for the rebate, I just have to continue using my Smart Tag with the Touch N' Go card everyday when I commute to work back and forth. 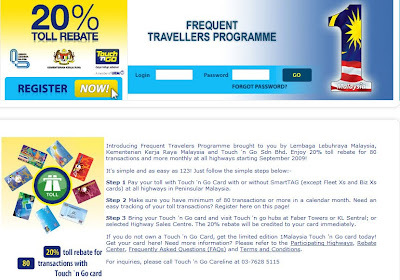 The only difference is I need to visit to the sales centers listed in the Rebate Center link on the page to redeem the rebate, instead of the convenient way to drive through the "Tambah Nilai" toll booth. Perhaps this is the first trick to make the rebate inconvenient to most people. Nonetheless, I think I am qualified to enjoy the rebate from the quick glance at the main page. So as usual me, I drill into the details to check whether any catch behind it. On step 1, it says "at all highways" in Peninsular Malaysia. Sounds good but don't be too excited, there is a link to "Participating Highways" at the bottom of the page. Tricky. If it's "all highways" then why they need to put up a list of "participating highways". I don't have a clue whether "all highways" are listed on the link, but most important is the highways I use daily, namely the Federal Highway (FH), NKVE or PLUS, SPRINT. I don't see Federal Highway listed, could it be Leburaya Utara Selatan (terbuka) or is it really "all highways" that accept Touch N' Go is counted in the program? The first round of rebate begins only on 5 Oct. And looks good on the location of rebate centers, there are few which I pass through in my daily route. So regardless consecutively or not, make sure you get your rebate to be credited into your card within 6 months. This is just my assumption though, better to call the customer care line to verify. The answer might be otherwise, that you lose your the previous rebate if NOT consecutive, the Jan rebate in the example given. Again, Blogger shrank the snapshot, so click here to go directly to the T&C page. It says the online transaction history is only kept for 3 months. So it's advisable to redeem your rebate within 3 months even though the rebate value is valid for 6 months as per the FAQ. Although it may be unlikely to happen, but this allows you to print out the transactions if you ever need to file a dispute where the rebate center does not allow you to get your rebate. Ok, done deal now. No hidden catch on this rebate, no clause forcing us to vote for any particular candidate/party in the next General Election :P Go claim your 1st rebate now in case of any swing decision by the government. Who knows, right?